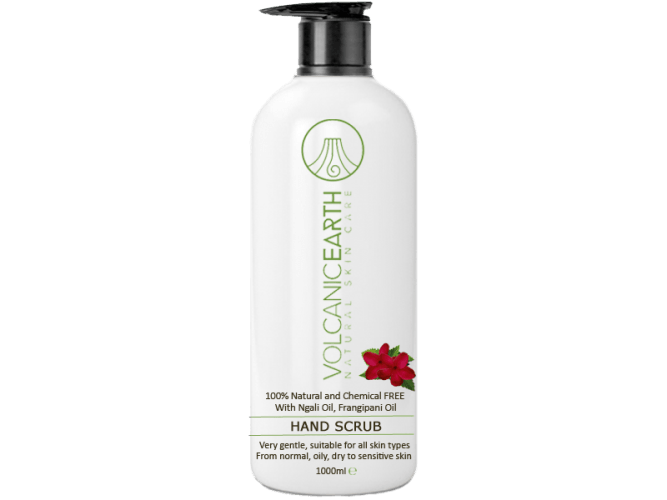 Volcanic Earth Hand Scrub is besides a scrub also a nourishing hand cream. The scrub exfoliates, cleanses, stimulates blood circulation, softens the skin and gives the skin a subtle fragrance of Frangipani. Unique to our Hand Scrub is that it is not necessary to rinse with water after scrubbing your hands. How? Gently massage your hands and/or feet until you feel no more scrub. The power of this exotic flower [Plumeria] is exceptional. The pure oil is exotic, very relaxing and softens your skin. Frangipani to treat hypersensitive skin, regenerates balance, support in soothing, inflammatory, renew skin cells, due to the frangipani sense also depression, fatigue, pains.Therapeutic Properties Described In The Aromatherapy Literature. Volcanic Earth Ash has a special activity. Not only the face (eczema, psoriasis, acne) but also the entire body has advantages of volcanic ash. Volcanic ash is mainly used for general health or beauty effect in Spa & Wellness. One can think of restorative effect on skin problems, rheumatism, muscle pain and osteoarthritis. Because of the heat it is also relaxing, stress-reducing, good for circulation. The sweat reaction effluent will be discharged through the skin. It's also arguably the most popular flower in the world and is certainly a "jewel of the South Pacific". Plumeria is one of the most exotic of all fauna and flora with invigorating scents that are known to affect the way people feel. There is nothing quite like the sweet fragrance of Plumeria in flower to uplift your spirits ... It's no wonder more and more people (Melanesians) continue to use the Frangipani plant extensively for decorative, skin care and medicinal purposes to this day. The Frangipani flower comes in a vast range of stunning colors with a wonderful, intoxicating fragrance. Colors range from white, pink, yellow, multiple pastels to deep red. Some variates produce smaller flowers than others. Flowering lasts up to three months at a time. Cut blooms last for several days in water. The Frangipani flower has a strong, delicious perfume which is even more prominent in the late afternoon, evenings and at night. What is Frangipani all about ? Frangipani Essential Oil is an exotic essential oil and most powerful flower. Frangipani essential oil is said to be one of the best perfumes in the world. Its fragrance has a provocative effect on those who inhale it, producing sensual feelings. Frangipani essential oil is an astringent. It is used in massage therapy to moisturize the skin. The oil will ensure the skin remains soft and works well with cracked and dry skin also.